The FOCIS PRO Touchscreen Tablet is a purpose-built Windows® computer equipped with AFL’s powerful SimpleView PRO analysis software. Capable of centering a fiber image, identifying critical core, cladding, adhesive and contact zones and detection of and tallying the types fo defects found, this software analyzes a typical fiber in under 5 seconds. Its bright, crisp display provides detailed images and its Zoom/PPan feature allows users to identify the smallest particles, scratches and imperfections. Its portrait orientation makes it easy to hold and operated with just one hand. Unique to all FOCIS products is a patent-pending feature, which simplifies before/after, jumper/bulkhead, insput/output, near/far and other common fiber cleanliness comparisons. Additional features include image capture and store/recall. Up to 1000 fiber images may be stored in on-board memory and images may be transferred via any off-the-shelf USB memory stick or SD flash card. The DFD1 incorporates a proven shock-absorbing rubber boot that doubles as a tilt stand and hanger. 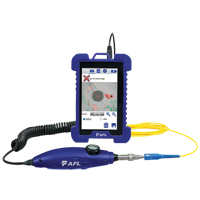 The FOCIS PRO Digital FiberScope is a high resolution video inspection probe. It is equipped with a focusing knob and image capture button. An extensive assortment of adapter tips allow it to be used with all types of fiber connector ferrules and bulkhead connectors. Bulkhead tips are available in multiple lengths as well as straight and 60° angle. Connector adapters are available in PL/UPC, APC polished ferrule in 1.25 mm, 2.5 mm and MPO connectors. NOYES FOCIS PRO solutions are packaged in a protective hard carry case that keeps all vital analysis, inspection and cleaning accessories close at hand and ready to go to work.